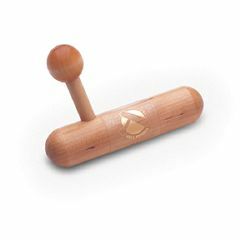 The Original Index Knobber is the second edition to the newest generation of colorful, molded, hand-held massage tools. Therapists' Choice . . . The Original Index Knobber was developed as a device to be used by practicing, hands-on therapists. Therapists who use The Original Index Knobber in treating patients find it extremely helpful in applying precise pressure to soft tissue trigger points. Index Knobber Massage ToolIt also reduces overuse injury to the therapists' hands brought on by the stress of hands-on deep muscle massage, trigger point compression and similar techniques. Like the Original Jacknobber, the soft shape and smooth feel of the Original Index Knobber and its unique, ergonomic design, allows its use over clothing or with massage oil directly on the skin. Focused Pressure Point Massage: The Index Knobber massager has one focused massage knob that allows you to concentrate a massage in one muscle area, offering relief and relaxation where you need it most. This is especially beneficial for those who have specific problem areas that require targeted attention. Advanced Grip: The advanced grip on the Index Knobber massager makes it comfortable to hold. Deliver an effective massage without having to readjust your positioning or having your wrist cramp up.